Researchers at the South Australian Health and Medical Research Institute (SAHMRI) and the University of Adelaide have discovered a faster, more cost-effective way to determine which DNA mutations cause human bowel cancer. This research, published in Gut, a premier world journal for colorectal cancer research, outlines a new preclinical pipeline, where different DNA changes are engineered into the normal colon in rapid time, cutting years off traditional laboratory experiments. The growing cancers can then be monitored in the state-of-the-art SAHMRI imaging centre by colonoscopy, CT, special in vivo imaging and PET. More than 4,000 Australians die from bowel cancer each year, and more than 17,000 new cases of this cancer will be diagnosed in 2018 – the Gastrointestinal Cancer Biology Group are working to understand the genetic drivers of bowel cancer, with a special interest in those cancers which are the hardest to treat, and which have the poorest prognosis. Study Co-Lead, Dr Susan Woods, said that with recent advances in genome sequencing more information than ever before is available about changes to the inherited material, or DNA, that occur in bowel cancer. Combined with exciting new gene editing technology (CRISPR), we can now deliver the same outcomes in less than a quarter of the time, meaning we can take research from the bench to the patient far more rapidly, and with far less cost. 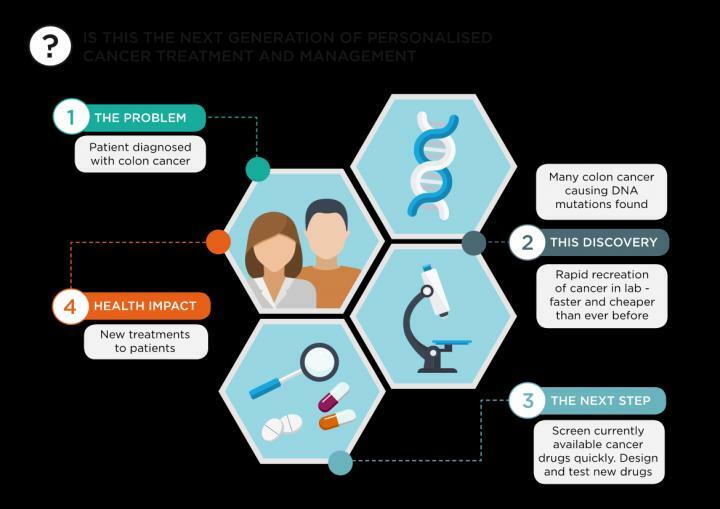 "Now, we have rapidly made new models of bowel cancer that mimic the complex genetic (DNA) changes that we see in human tumours and recapitulate features of the human disease," Dr Woods said. "Our new technology allows us to screen and repurpose existing drugs which may not have been tested in bowel cancer, to screen potential new life-saving drugs as they are developed, and to improve bowel cancer detection, by being able to watch the cancer develop in real time." This new method helps determine which DNA changes are important to the cancer, in a fraction of the time, at less expense and using fewer animals than traditional genetically-engineered models that are used in cancer research. Analysis of the models, combined with patient data, has suggested potential drug vulnerabilities that are being tested.